Note: The Sigma 18-50mm f/2.8 EX DC Lens has been replaced by the Sigma 17-50mm f/2.8 EX DC OS HSM Lens. The Sigma 18-50mm f/2.8 EX DC Lens contains a nice general purpose focal length range, is well-built and does not cost a fortune. Like Canon's EF-S Lenses, the 18-50 DC is compatible only with 1.5x/1.6x crop factor digital SLR cameras. Being sized for a smaller-format sensor allows a smaller and less expensive design to be used. And, the overall size and weight of the Sigma 18-50mm f/2.8 EX DC Lens is ideal for the cameras it is designed for. Measuring 2.9 x 3.3" (74.1 x 84.1mm)(d x l) and weighing 15.7 oz (445g), the Sigma balances and handles very nicely - and feels solid. The Sigma 18-50's AF sound is relatively quiet but not silent like an HSM or USM lens. AF speed is on the slow side of average. AF accuracy was also on the low side of average. When shooting the very well-lit ideal focus point on ISO 12233 chart tests using AF, every other image was completely out of focus at 18mm f/2.8 and AF was inconsistent at 24mm. In real world use, I missed a noticeably higher number of shots than I should have. AF performance was especially poor in low light (where focus hunting is frequent). Results were also poor in AI Servo mode. This is an internal-focusing lens - It does not change length during focusing and the front element does not rotate. FTM (Full Time Manual) focusing is not supported - and - the focus ring turns during autofocusing. The Sigma's 18-50's minimum focus distance is 11" (0.28m) and provides a reasonable .2x magnification factor. Both the zoom and focus rings rotate the same direction of Canon's lens rings (this is a nice feature if you are used to Canon lenses - and especially if you are mixing this lens with other Canon lenses in a kit). A zoom lock switch is provided but not needed with my copy of this lens as the zoom ring requires a firm force to twist. Both zoom and AF (autofocus) rings turn smoothly. 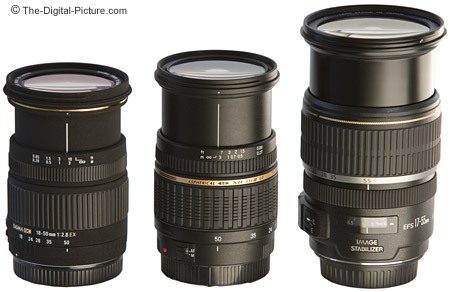 Pictured above from left to right are the Sigma 18-50mm f/2.8 EX DC Lens, Tamron 17-50mm f/2.8 XR Di II Lens and Canon EF-S 17-55mm f/2.8 IS USM Lens. The same lenses are pictured fully extended below and with hoods later in the review. The optical quality of the Sigma 18-50mm f/2.8 EX DC Lens is decent - it delivers good results for the price. If proper focus is achieved, images are sharp wide open and even better stopped down a stop or so. Right side sharpness is very good, but left side sharpness is very bad. Vignetting performance is decent - You might notice some minor vignetting if your subject or background is a solid color, extends to the corners of the frame and the lens is used at f/2.8. Some CA (Chromatic Aberration) is noticeable - especially in 18mm corners. Flare is not well controlled - The Sigma 18-50 needs improvement in this area. Distortion ranges from mild barrel at 18mm to near distortion free at 35mm to slight pincushion distortion at 50mm. Colors seem fine - neutral. Some people think this lens produces warm/yellow results, but I am not noticing this. The 7-blade aperture produces nice out-of-focus highlights. Comparing the Sigma 18-50mm f/2.8 EX DC Lens with some similarly spec'd lenses ... 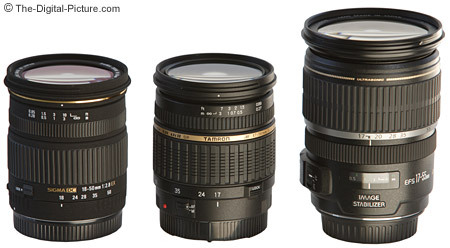 The Canon EF-S 17-55mm f/2.8 IS USM Lens and Tamron 17-50mm f/2.8 XR Di II Lens. Both are shown along with the Sigma in the above and below pictures. The Canon 17-55 IS is my preferred general purpose lens for my 1.6x camera body at this time. The size difference between these two lenses is large - and is apparent in the pictures. The Canon is .4" (9.5mm) wider and 1.1"(26mm) longer. The weight is noticeably different as well - The Canon weighs 6.4 oz (200g) more than the Sigma. The Canon and Sigma are similarly sharp in the center at all focal lengths. On the left side of the frame, the Sigma significantly trails the Canon. On the right side, the Sigma is at least as good until the mid focal lengths are reached. At mid zoom range, the Canon begins showing better edge performance - becoming much better at 50mm. The Sigma 18-50 shows less vignetting than the Canon. I wouldn't deem either lens "flare-resistant". The Sigma shows more CA than the Canon. Canon has the obvious focal length advantage. The Tamron 17-50mm f/2.8 XR Di II Lens is very, very similar to the Sigma 18-50. These lenses are more similar than different. They are very similarly sized and shaped. They function very similarly. The differences? The Sigma flares more easily. The Sigma shows more CA. The Tamron is noticeably wider (17mm vs. 18mm). The Tamron focuses faster but the Sigma focuses more quietly. The Tamron focuses much more accurately - My keeper rate is far higher with the Tamron. My Sigma has a weak left side - For sharpness, the Tamron beats the Sigma easily on the left side, but the Sigma is slightly better on the right. The Sigma rings rotate the Canon direction, the Tamron rings rotate the opposite direction but with less effort. The Sigma is less expensive (but not by much). 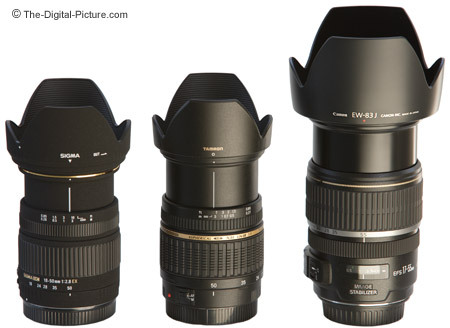 The Sigma's requires its lens hood to be removed to install/remove the lens cap. 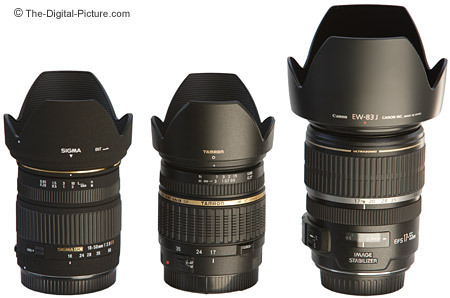 My choice would definitely be the Tamron 17-50mm f/2.8 XR Di II Lens over the Sigma. Sigma includes a nice padded case and a lens hood with this lens. The filter size is 67mm - You will need to know this when you order the Tamron 67mm lens cap to replace the OEM cap. You can get the Sigma cap on and off with the lens hood in place, but unless you have long, strong fingernails, it is easier to remove the hood first. Tamron's center-pinch cap resolves the problem. The small hood is nice otherwise. The Sigma 18-50 features Sigma's standard matte black (with a little fine glitter) finish. It is not my favorite, but some like it. It has no affect on image quality or functionality. The Sigma 18-50 is available in Canon (reviewed), Nikon, Sigma, Pentax and Minolta mounts. My standard disclaimer: You should be aware that there are potential issues with third party lenses. Since Sigma reverse engineers (vs. licenses) manufacturer AF routines, there is always the possibility that a new body might not support an older third party lens. There are examples of this happening in the past. Sometimes a lens can be rechipped to be made compatible, sometimes not. Hitting home: The Sigma 18-50mm f/2.8 EX DC Lens reportedly did not function correctly on the Canon EOS 20D when the camera was first released. Apparently a microchip replacement in the early lenses resolved this problem. Additionally, there is the risk of a problem that results in the lens and body manufacturers pointing blame at each other. However, Sigma USA's 4-year warranty is far superior to Canon USA's standard 1 year warranty. 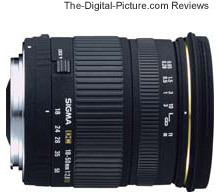 For the price, the Sigma 18-50mm f/2.8 EX DC Lens is a good value. It is definitely an upgrade from the Canon EF-S 18-55mm f/3.5-5.6 Kit Lens.